1. Choose a quiet undisturbed 10-15 minutes. Lie down on the floor or bed. Have your seven chakra swatches with you. 2. Close your eyes and relax. Now place all seven color swatches upon the chakra points of the body, as shown in the illustration above. 3. Breathe deeply and allow your body to absorb the rainbow energies. Take several more deep breaths, focusing on each chakra and drawing the color from their swatch into your body. Know that chakras are aligning and strengthening. 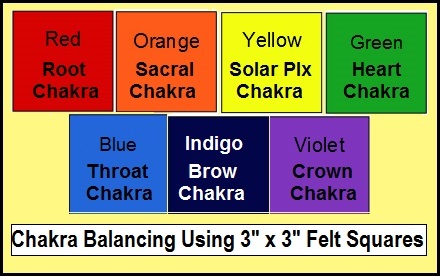 Feel yourself balancing, as you absorb these colors through your chakra centers. Continue until you feel fully balanced, charged, and aligned.